Warning: This post may leave you with a permanent aversion to turkey necks… or perhaps an unhealthy attraction to them. It’s surprising how often I have a week where the coincidental funnies all have a similar theme. That’s what happened this week: it was all (loosely) food-related. The first laugh occurred when I was eating lunch, digging happily into a giant jar of sauerkraut. (For those who are shuddering right now, Hubby completely agrees with you.) But I love sauerkraut despite the fact that it looks like something long-ago-drowned and smells like rotting socks. You know how you’ve got that one little spot in your throat that’s supersensitive to everything from toast crumbs to pickle juice? That spot where the slightest touch makes your throat spasm and your eyes tear up and your nose run; and if you try to talk you sound like the Godfather with laryngitis? Yeah, that one. I’d like to know what evolutionary function that stupid little spot ever served. It can’t be some built-in defense against poisoning, because by the time anything gets down that far it’s already too late. The second laugh (albeit accompanied by a shudder of revulsion) happened when I was cooking a turkey on Saturday; a largish bird because we were going to have ten people around our table. What’s funny about that, you ask? Well, the story started last week when one of my internet searches went off into the weeds, and in the process of navigating back I ran across onanism (children, take your hands out of your pants and look that up). That led to the unwelcome discovery that medieval women sometimes used turkey necks for, um, non-nutritional purposes. It’s a cat-owner’s most frequent view of the cat. Merriment ensued, but we lost it completely when one of my friends (who shall remain nameless to protect the guilty) not-so-innocently remarked, “Gee, you could have made it really Christmassy by leaving a bit of tinsel hanging out of the hole.” If you’ve ever owned a cat or dog, you know how that story goes. And that was my week, from beginning to, um… end. How was yours? The turkey neck thing reminded me of a funny from years ago. I worked a t a place that had a huge area devoted to welding, machining, metal fabrication of all types, painting, and assembly. One of the assembly guys, a real prince of a fellow, no kidding, was diagnosed with a brain tumor. Benign, thankfully, but it was a big deal and a very risky procedure to remove it. All went well, and after a period of time he was permitted to come back to work for a couple of hours a day and then work up as he became stronger. First day back to work, I joined the guys at the break area to welcome him back, and the conversation turned to the surgery, of course, then it drifted to the tumor itself. The former patient said, “Well, here. Wanna see it? They let me keep it.” Then he pulled a baggie out of his pocket with a raw chicken neck in it and tossed it on the table in front of the other one. He stood up, grabbed his mouth, and bolted for the restroom. He didn’t quite make it. Fun place to work. Good people, good products. I miss it. Bahahaha!!! Not nice. Not nice at all, but very, very funny! Then again, it’s easy for me to laugh because I have a pretty strong stomach. (I’ve actually continued to eat pizza after a guy puked on the table right in front of me. He didn’t splatter my pizza, fortunately.) I guess it wouldn’t be too funny for the poor guy who lost his lunch, though. Wonderful. Love stories like that. An acquaintance of mine, years back was in construction and was often a passenger in small aircraft back and forth to construction sites. He was always being razed for how easily he got airsick. So one day after a flight, he dumped a can of cream corn into an airsick bag and walked into the hanger office with a spoon and proceeded to eat it. The rest as they say, is history. The old turkey neck trick. More than 4 decades ago, I was working for the Here Before Christ company in the Canadian arctic. There were three nurses at the local nursing station where many of us single guys hung out. The head nurse was a British city girl and the other two were Alberta farm girls. This was the Brit’s first Canadian Christmas and she was doing it up in style. It was also her first turkey, which she was in the kitchen preparing for the oven, while the rest of us were siting around in the livingroom…waiting. Suddenly there was a loud shriek from the kitchen. She had reached into the turkey and grasped the neck which she had no idea was there. Fortunately there were no emergencies for the next few minutes as no one was capable of even picking themselves up off the floor. Oh, that’s hilarious! One of my friends spent years nursing in remote areas, so I can vividly imagine the scene from memories of my visits with her. The usual ‘special meal’ up there was freshly-caught arctic char. Yum! My mouth still waters! Where did your friend nurse? This was in Cambridge Bay back in 1973. Never would have left the north but I got lonesome for cows. Also got an offer I couldn’t refuse. My girlfriend said if I married her she would put me through grad school before she started a family. Done deal. LOL! That’s definitely a good offer! My friend was mostly up on the reserves in northern Manitoba in the late 70s and early 80s, but she did a few stints farther north, too. I can’t remember exactly where, but Baker Lake rings a faint bell. You were even ‘norther’ than her, though. ‘Got lonesome for cows’ made me laugh, but I think I’d get lonesome for trees. I’ll be laughing over this one for a long time. Almost had my own throat tickle kick in. Mine usually ends up with a series of sneezes too. Women using the turkey necks “back in the early times” makes me want to laugh, cry, gag, cringe, shudder, name it, something I want to forget, but won’t! Egads. That tears apart every romance novel scene in 1,000’s of books out there. LOL! I love the progress bar on #11. Greatest series ever written Diane, seriously. And am I ever glad I never read historical romances, ’cause they’d be completely wrecked for me now! I’m right there with you, cringing and shuddering. Brrrr! Your week went in an entirely different direction from mine, looks like. All I can say is I love teaching college students, and I have 406,579 words smeared on 881 pages. No clue what that translates into as a percentage of completion, but I’m probably past the halfway mark. Maybe. Ish. But you’re rockin’ patht eighty per thent! Thwell, thithter! You tho rock! I take full responsibility. But just so I know… should I buy a bulletproof vest? Dunno. Thorry, thithter. The jury ith thtill out. Perhapth hithtory will dethide. Hehehe! Fun post, Diane, that hit the spot. I don’t think I’ve ever seen a turkey neck, apart from a live one, that is. On a live turkey, I mean. And that’s a cute hot-pad… it is an all too familiar sight. Hmm, maybe it’s time for me to invent a new Jeopardy-type board game! But on second thought, I’m not sure I really want to examine all the bits and pieces lurking inside this brain. That could be scary. But no doubt enlightening too! LOL! Aw, go on! Ya know ya wanna! I find crocheting far more relaxing and enjoyable than knitting – I only have to pay attention to one stitch at a time, and ripping out is easy. Knitting is fraught with peril – if I drop a stitch I have no idea how to get it back and then it wrecks the whole project. And I never seem to have the same number of stitches from row to row. I can crochet anything, but scarves and dishcloths push the limits of my knitting skills. It’ll be worth it just to make one and see how long it takes my rather tightly wound sister and only slightly less wound mother to figure out what they are and gasp in horror. I can see the pucker factor increasing already! *giggles wickedly* I’d love to be a fly on the wall for that! That spot in the throat — for me it’s always a too-large particle of black pepper. You described the symptoms exactly! And the TV show that elTea referenced, I think it was Ally McBeal. Oh, black pepper! Yep, that one’s gotten me a few times, too. I just don’t understand why we have that inconvenient spot. The last time I saw the word onanism was when I was about thirteen and reading the Bible. Lots of begetting and begatting in that book. My pubescent mind was all in a whirl. As I am down to 9 cats I can totally relate to that part of the story. As usual your post has lightened my day! Turkey necks—ugh! Love the potholder, our daughters may get one soon, lol. Thanks for the giggles. I’m glad you got some giggles! 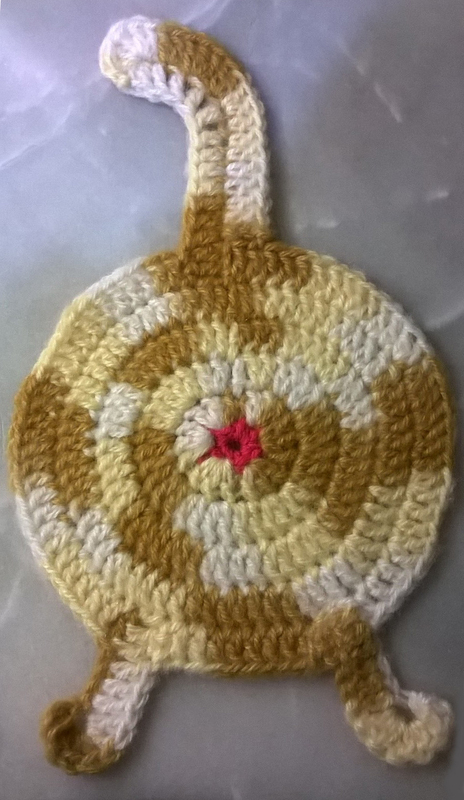 🙂 And the potholders were super-easy and quick – only about 1/2 hour each. I didn’t have a pattern, but you could probably find one online somewhere. Our cat must be an over-achiever; he once swallowed a foot of one-inch wide red ribbon. Yeah. I had to assist when it made its reappearance approximately six hours later. To his credit, he did most of the work; it was only the last few inches that I had to help with. Since then all ribbon in our house is kept under lock and key. P. S. I do love the crocheted cats! My cat did the same thing. I had a robe that had 1/8″wide ribbon woven through the lace at the edge of the scooped neckline with a yard or so extra on each side to use to tie the front closed. There had to be 3 yards of ribbon on that gown. When I found my robe next, it was on the floor with 8 inches of ribbon remaining with one edge all chewed up. I called the vet and they told me that that sort of ribbon could cut off circulation in the small intestine or else cause a blockage. They X-rayed him to see if he would need surgery. Luckily it had almost made it through and was easily extracted manually. I learned that string, thread, rubber bands, etc. had to be kept carefully out of Kitty’s way. Wow, that’s one lucky cat – usually that amount of ribbon would be enough for a very expensive trip to the vet. Our cats never got into anything like that, but the dog once gifted our entire back yard with gold-tinsel ‘decorations’. It was very… um… festive. I got a giggle out of the crocheted cat-butts, too. They were fun to make! This was not at all the direction I thought you were going. There was a period in law firmTV shows that seemed to compete with similarly themed TV shows by having some very quirky characters. One show had a younger male character with a bit of a fetish for older women with neck wattles. I found this to be extremely quirky, and your blog title made me think that you were headed in that direction. But you managed to find a gross, far quirkier image to link to turkeys. Ewwww! I’ll never be able to look at a turkey neck again without a dose of brain-bleach. Where might one pick up a gallon or two? I only wish I knew. That was knowledge I definitely could have lived my life without. And being the generous and selfless sort that I am, I had to share the pain – sorry about that. You’re welcome – I’m glad you got a chuckle!